Ah yes...the humble Mexican lime has as many uses as it does its many names. You might know them as "Key limes", "Bartender�s limes", and even the "West Indian lime". We're still not sure how the name went from Mexico to the West Indies...but no matter, they are still the "key" ingredient in everyone's favorite Key Lime Pie! 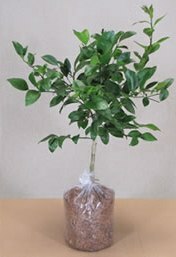 Helpful information: Mexican lime trees are sensitive to cold. The blossoms are pure white and fragrant. The fruits are small, approximately one and one-half inches in diameter, and almost round, with a thin, smooth, greenish-yellow rind at maturity that is especially fragrant.